PHOTO (from left to right): Barry Simon, President of Oak Hill, State Representative Jay Case (R-Winsted), Alyssa Goduti, President and CEO of CCFSA. HARTFORD – The Connecticut Council of Family Service Agencies (CCFSA) has given State Representative Jay Case (R- Winsted) its 2018 Annual Family Legislator of the Year award because of his unwavering support of CCFSA’s mission to strengthen the state’s diverse individuals and families, and the communities in which they live. Rep. Case serves as Ranking Member of the legislature’s Human Services Committee. He also serves on the Internship and Appropriations Committees. In addition to his role as state representative, Case is a Board Member of the ARC of Litchfield County (LARC) and has volunteered with Special Olympics Connecticut. Rep. Case is also a co-founder of the legislature’s Intellectual and Developmental Disabilities (I/DD) Caucus. This bi-partisan caucus works on shaping public policy based on the needs and input from the I/DD community in order to strengthen the safety net, which directly aligns with the overall mission of CCFSA. “Representative Case is a true advocate for human services. In light of difficult budget constraints, he continually supports measures to provide resources to programs that strengthen the safety net. He promotes the use of outcome data to drive funding decisions and emphasizes the value of collaboration and innovation, as demonstrated by CCFSA’s network human service delivery model. 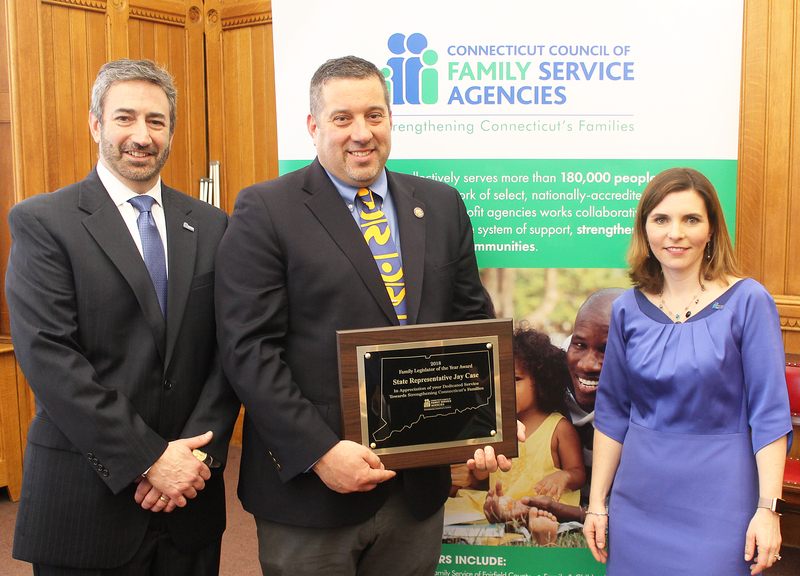 The Connecticut Council of Family Service Agencies is appreciative of Representative Case’s ongoing efforts to ensure essential, high quality services are available to the 180,000 children and families we serve,” said Alyssa Goduti, President and CEO of CCFSA. CCFSA is a statewide network of fifteen independent, non-profit, family service agencies that make services available to families throughout Connecticut. CCFSA’s Member Agencies have served the Connecticut for over 100 years. They are all community-based, licensed by the state and are also nationally accredited. CCFSA’s operations are facilitated through a committed network of almost 5,000 employees.